As the researcher and his postdoc turn their eyes to the screen before us, everything fades to black. Then 60 pixels appear, in varying shades of gray. This is a hint of what it’s like to be blinded by retinitis pigmentosa—and then to regain that stolen vision with the help of technology. The pixels are difficult to parse, but when a little blur is added, I can make out the image on the visual prosthesis simulator’s screen: It’s a smiling face. For people regaining the ability to see, this simple grin could transform their ability to interact with the world. It’s all thanks to a retinal prosthesis system called Argus II, one of the high-tech tools developed partly through the USC Eye Institute at Keck School of Medicine of USC. 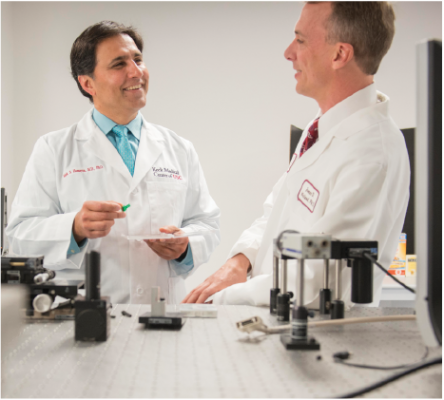 Researchers at the institute are rapidly advancing the science of vision and bringing together physicians and scientists to develop treatments through optical, electronic, biomedical and materials technology. Their work has a potentially huge impact: More than 4.1 million Americans over age 40 suffer from some vision impairment, including serious eye diseases such as glaucoma, which affects 2.7 million people. Nearly 1.3 million people in the U.S. can’t see at all. 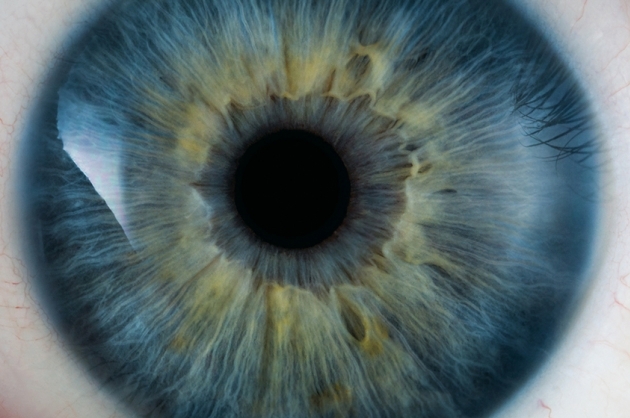 Now new devices and treatments are countering once-incurable eye diseases. The world’s first retinal prosthesis and artificial retina, Argus I (manufactured by Second Sight Medical Products), was researched and developed by Mark Humayun, USC professor of ophthalmology, biomedical engineering, and cell and neurobiology, who first implanted it in patients in a clinical trial in 2002. The updated version, Argus II, was approved by the Food and Drug Administration (FDA) for use in patients in 2013. The device provides limited but useful vision to patients with retinitis pigmentosa, an inherited degenerative disease that affects the light-sensing cells of the retina. During the simulation, I experienced the world from the point of view of a person who suddenly receives sight thanks to the Argus II. The demonstration can’t exactly replicate what that person sees—how we see the world differs from person to person—but it illustrates the experience powerfully. The retinal prosthesis uses a camera mounted on glasses that sends a wireless signal to an electronic receiver with 60 electrodes implanted in and around the eye. The electrodes send controlled electrical pulses to stimulate the remaining neurons in the otherwise blind retina. Wearers can make out large objects and see light and dark. In the next generation, the 6-by-10-pixel grid will likely grow to 12 by 20 pixels, adding further clarity to the picture. Because the camera is mounted on glasses, the wearer must turn her head where she wants to look. But Humayun and his colleague, Armand Tanguay, USC professor of electrical engineering-electrophysics, biomedical engineering and ophthalmology, are already working to improve on that. 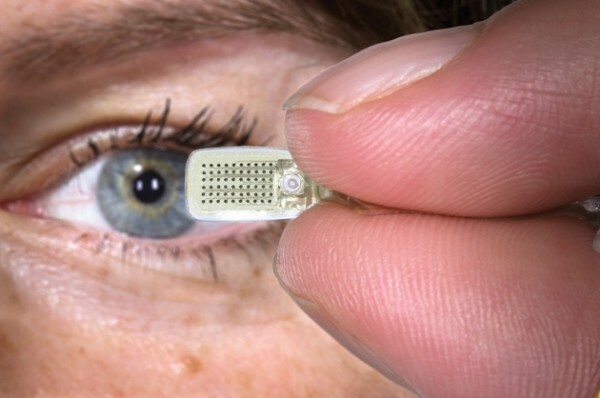 They’re developing a tiny camera that could be placed inside the eye along with the electrode array. That way, the wearer’s perspective would be synced with the eyes instead of the head. But making an ultra-miniature camera is no trivial task. “We have to violate most of the principles that we teach in class to figure out how we’d make a camera this small,” Tanguay says. Measuring about 3 millimeters by 4.5 millimeters, it’s a third the size of a Tic-Tac. It’s designed to fit inside the crystalline lens sac, just behind the iris in the eye. Blending science, health, technology and research was key to developing the complex retinal prosthesis, and USC researchers aren’t stopping there. One project in development takes a complementary approach to wearable visual aids. It uses a wearable computer that can interpret the visual information captured by several miniature cameras mounted on a pair of glasses. James Weiland, USC professor of ophthalmology and biomedical engineering, who has helped develop intraocular retinal prostheses, explains how it could work. Research shows that blind people follow simple voice commands to navigate through complex environments, Weiland says. The system would work like a more sophisticated pedestrian GPS, advising the wearer to go left or right to avoid obstacles. The team is developing novel cameras and biologically inspired algorithms to take video and reduce the complexity of the world down to the essentials: where a sidewalk is, where a stop sign is or where an obstacle is. The glasses could be paired with a smart vest that gives physical signals, guiding a person toward something (like a particular product in the supermarket) or away from danger. Function is only half the equation when it comes to designing a wearable biomedical device or product. “Cosmesis—how something looks—is really important,” Weiland adds. “Sunglasses would probably be OK. But anything that has a large, obvious piece of hardware isn’t going to fly.” The team has tested a complete prototype system with people who use a smartphone interface to navigate a course or try to reach for a particular object. 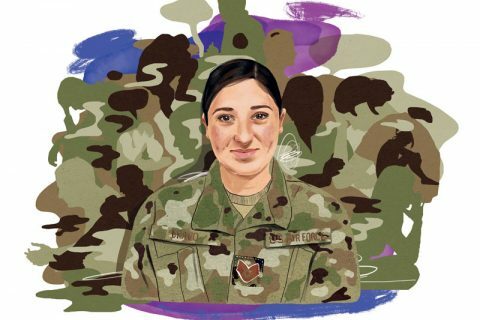 Funding from the U.S. Army supports this research; traumatic brain injuries are the signature injury of the Gulf wars, and 30 percent to 50 percent of people with brain injuries have visual symptoms that range from blurred or double vision to more debilitating injuries, Weiland says. Wearable devices could aid people with a wide range of visual impairments, the researchers say, including low vision, glaucoma and diabetic retinopathy, which renders people blind by damaging the blood vessels of the retina. All of these technologies rely on an understanding of how vision works. The retina, multiple layers of tissue along the back wall of the eye where light-sensing cells are housed, is actually part of the brain. Light is detected by 100 million photoreceptors in the back of the eye and translated into electrical signals. One of the reasons that so much of the brain is devoted to vision is the staggering amount of information transmitted. In contrast, the ear only has about 50,000 sound-detecting hair cells. “We get so much of our information to function in the world from vision. We really are visual animals,” Weiland says. Humayun’s research into prosthetics began when his grandmother started to go blind. His research showed that despite near-total loss of the light-sensing cells in patients with retinitis pigmentosa, working neurons still remained in the inner part of their retinas. “These were retinal ganglion cells that had been sitting there dormant for three decades,” Tanguay says. “Yet they were still viable. If you lay your arm down and leave it for three days without moving it and try to pick it up again, you’ll definitely notice that the muscles start to atrophy. 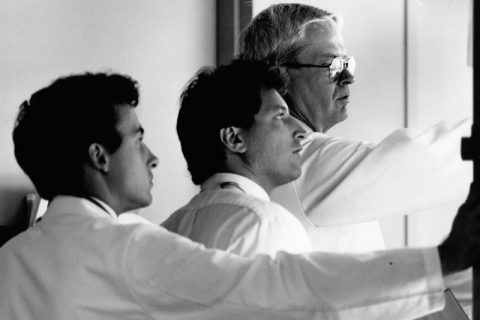 But these output cells were still viable 30 years after they stopped getting signals.” In 1992, Humayun found that stimulating a tiny region of these cells with an electrical signal allowed a patient to see light. A healthy eye has a resolution of about 4,000 by 4,000 pixels, and a laptop screen is 1,000 by 1,000 pixels, but USC research shows that a person only needs about 25 by 25 pixels (625 pixels) to function in daily life. Right now, patients with the Argus generally see grays and blacks, although some have reported seeing a few colors. Increased resolution and color vision are on the wish list for future generations of prosthetic devices. Researchers are studying other strategies as well. 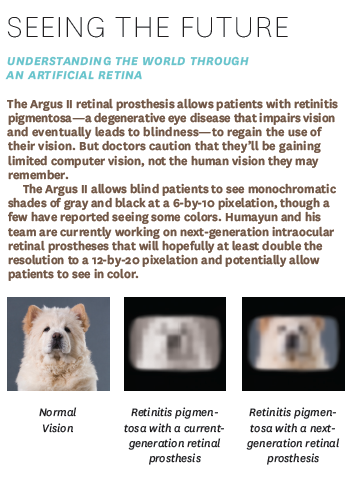 In the future, the need for retinal prostheses might be avoided through early interventions and genetic therapies. The earliest changes in patients with age-related macular degeneration (AMD), a leading cause of vision loss after age 50, occur in what are called retina pigment epithelium (RPE) cells. In advanced AMD, patients lose RPE cells in the macula, a central part of the retina that’s critical to seeing precisely. 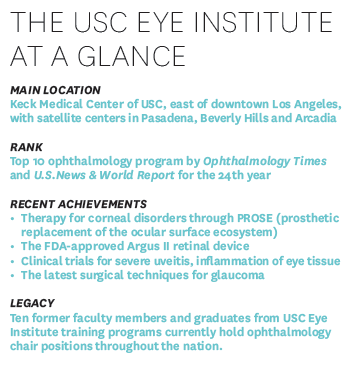 In lab studies, David Hinton, professor of pathology, neurological surgery and ophthalmology at Keck School of Medicine of USC, and his team have grown stem cell-derived cells that can be surgically implanted under the retina, replacing diseased cells and preventing further damage to the photoreceptors, the light-sensitive cells of the macula and rest of the retina. 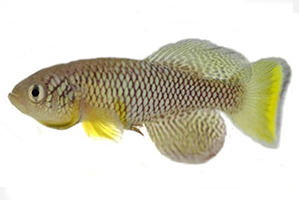 They’ve been able to delay degeneration and restore vision in lab models. The researchers hope to open the investigational treatment to patients in a clinical trial in spring 2015. With an aging population, eye-related diseases are likely to touch a growing number of people every year. AMD currently affects more than 2 million Americans over 50. By 2020, another 2.95 million are expected to be diagnosed with the disease. The need for solutions to vision problems will only keep mounting, but the scientists are readying for the call. They might even make artificial vision more powerful, in some ways, than the original. The simple act of finding an escaped carrot—a difficult task for a blind person—could be nothing short of revolutionary.